February 20, 2019, "Tajemná Odysea - Mysterious Odyssey" Teaser from Victoria Fan Film Production, Czech with English subtitles. To be released in Dec 2019, https://youtu.be/Avoj-4eggHA (5:03). See their Facebook group at https://www.facebook.com/Victoria.fan.film/. January 14, 2019, New Release from FS Film, Czech with English subtitles. High-quality Silver Age production, sets, greens screens, CGI, adult fans, good writing. The First Federation takes action during the Dominion War. Gambit of the Ancient Ones, https://www.youtube.com/watch?v=KSYYFgKfyX4 (9:40). 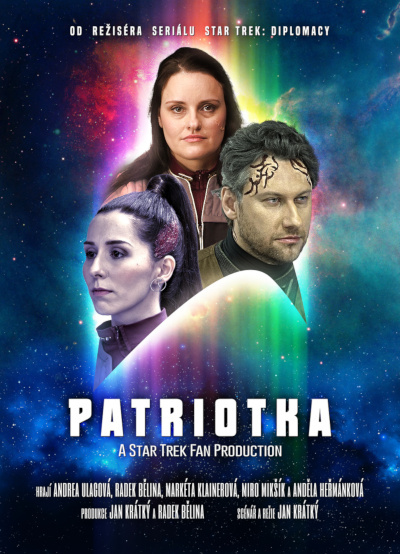 For links to all Star Trek Fan Films from FS Films, see https://startrekreviewed.blogspot.com/2009/06/141.html. January 25, 2018, MAJOR NEW RELEASE from pjotr426, a filmmaker not previously covered by Star Trek Reviewed, Star Trek Lego -- Paradox (Czech with English Subtitles, animated, brick, Silver Age), https://www.youtube.com/watch?v=iV6BO2f2za8(36:00) Appears to mix TNG with DS9. For its permanent home, see http://startrekreviewed.blogspot.com/2009/06/145.html. For more Lego-based Star Trek Fan Films see http://startrekreviewed.blogspot.com/2009/06/206.html. 8/20/2014 Headline: Prelude to Axanar now available with Czech subtitles: https://www.youtube.com/watch?v=1W1_8IV8uhA (21:09). For additional information about both Prelude to Axanar and Star Trek Axanar, see http://startrekreviewed.blogspot.com/2009/06/14.html . They are working on a second film. Soubor stáhnete tak, že kliknete na jeho název nebo velikost.